The sky is a soft, baby boy blue. There is just enough breeze that I can see the tip of the American flag waving by the window. The sun is shining. And it is 69F. Oh I know that spring is on its way. About how much different this campout will be for Darian this weekend. The last one he went on in January was freezing cold with snow on the ground. Today they predict will get up in the 70's and tomorrow will be a high in the upper 50's. Although it will still get down into the 30's at night...maybe he won't freeze. That is if he remembers why it is important to change out of the clothers you wore all day into dry ones and to take his gloves. the warm weather and the impending arrival of spring. The tulips and the daffodills are peeking through the ground out front. Last night we all ate salads for supper. Can't wait for those big juicy tomatoes coming from my garden. Along with the cucumbers and peppers. Still working on the pictures in Picasa. Maybe I will get that done this weekend. 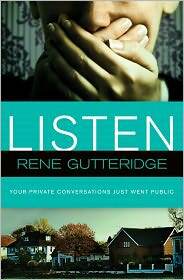 A book names "Listen" Is about a small town with a website that someone is posting private conversations on.....interesting! I want to start some spring cleaning.....Darian's room first. He won't be here all weekend. is eating potato chips with sour cream. the sky is inky black but there are some twinkling stars. The temperature has dropped to 40F after a glorious 62F today. But, the weatherman says it will only get up to 40F tomorrow and we will have a brief taste of winter once again. These are the days after winter and before spring that I don't like. Why do I keep wishing that spring would get here. I am only wishing away my life. I should be thinking what a glorious day this was and be happy with that. Girl Scout Cookies.....I ate a whole box of Carmel Delights all by myself last night as I was reading! to bed soon. I have a headache, and a neck ache and my eyes hurt. spring comes soon....see, there I go doing it again. CNN from the other room. How much news can a man watch??? I haven't done much of anything. Today I did think that it would soon be time to start to clean out the flower beds. As if I need something else to do. is seeing members of my family. And today I saw and visited with my niece Debbi and saw my brother Chuck and sis-in-law Pam. Was good to visit with them all. this is my four day to work weekend and I don't plan any further ahead than that. that is me catching a nap on the couch and some smart Alec kid with a camera.